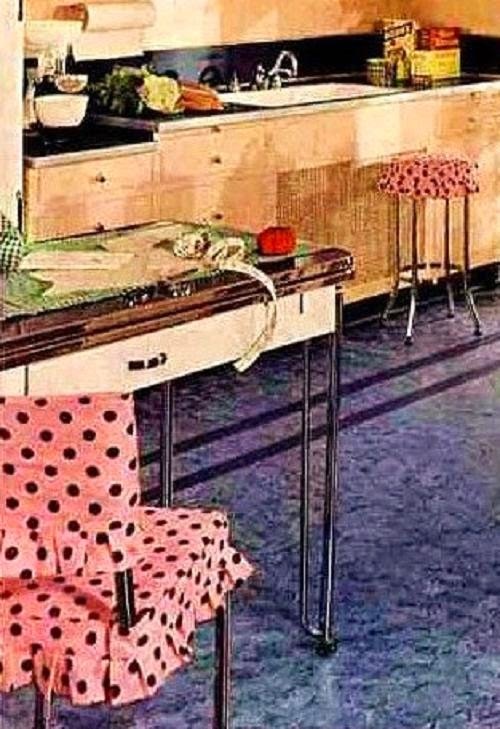 Farm Girl Pink....: ~ Armstrong Linoleum... the kitchen/office in dots! 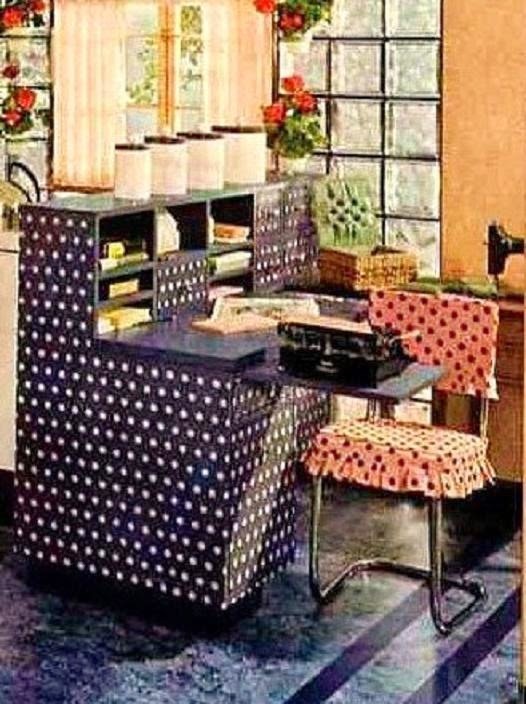 ~ Armstrong Linoleum... the kitchen/office in dots! How amazing. 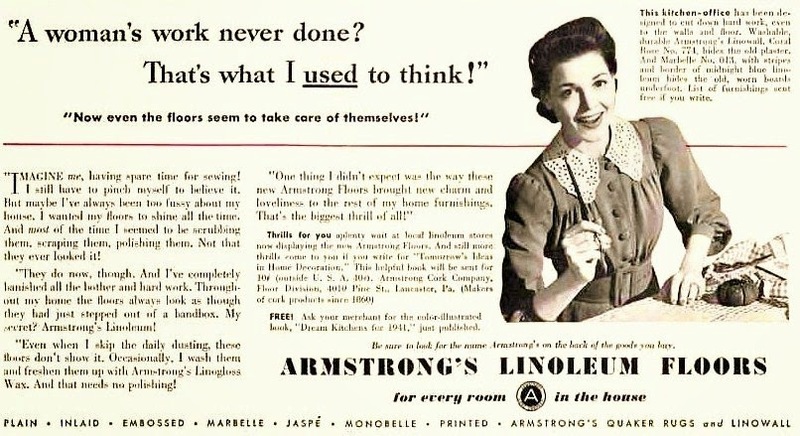 I am never bored by these charming vintage Armstrong Linoleum advertisements. What I love is the testimony of the housewife. How she does not have to wax her floors, daily, to keep the shine anymore. 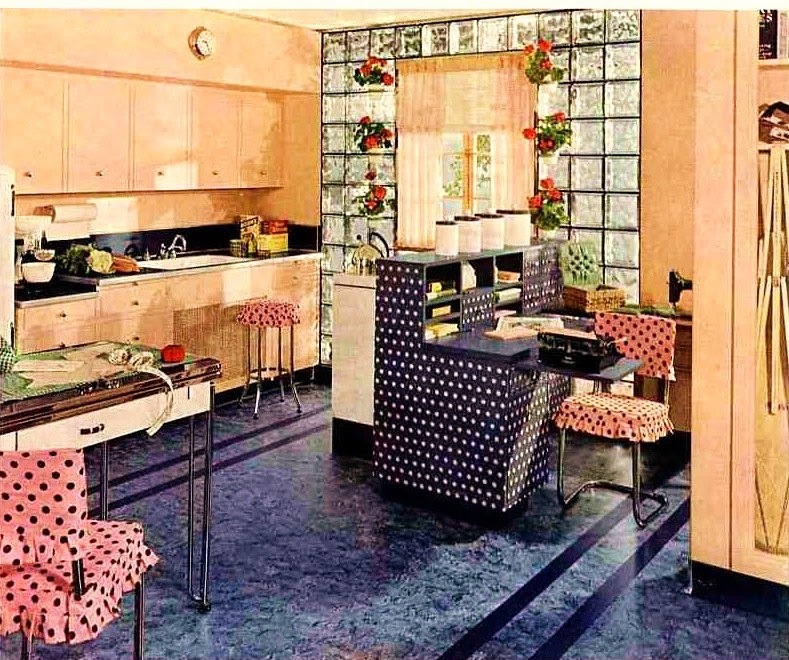 She has the new improved Armstrong Linoleum in her kitchen. That she can even skip a day dust mopping them! Holy cow. I am lucky if I get my kitchen floor swept twice a week. And these ladies in the 1940's have a routine were they were waxing them daily. Those girls were dedicated! As I was reading through this little advertisement I realize that this was a new concept. Having the kitchen be an all in one for the wife. Where she cook, sewed and did the bookkeeping in her kitchen. I bet this is about the same time, that the washer machine found its way into the center of the kitchen too. I find all the polka dots a nice cheery touch for this room. Plus it is pink and navy. Love it! With the glass brick wall bringing in tons of light to the room. 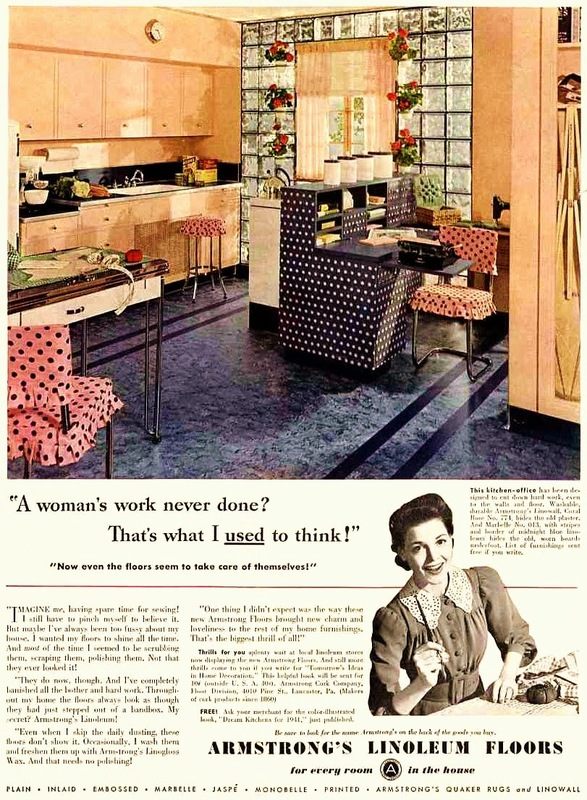 Yet, I am still amazed that women were worried with a daily waxing of the floors. Makes me very thankful for my no wax floors! But I can recall my Grandmother would wax her no-wax floors. And it drove my Aunt crazy. Yet, my Grandmother had the shiniest floors you ever seen. Now I realize where that obsession came from. It was just a habit formed in her early married years. That your floors could never be too clean. Or shiny enough!